CalculateFull Application Method in VBA is used to forces a full calculations in the all open Workbooks data. Please find the syntax and examples of CalculateFull Application Method in VBA. Here syntax for CalculateFull method of application object in VBA. In the above syntax Application represents object and CalculateFull is the method of Application. 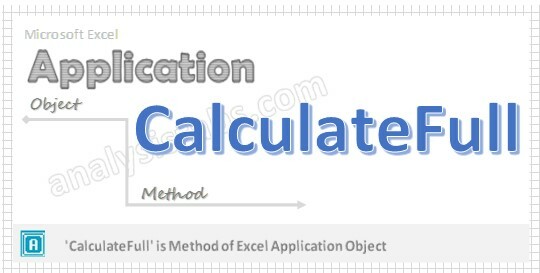 Please find the below example for CalculateFull method of application object in excel VBA. The below macro is used to forces full calculates in the all open workbooks data. Step 5: Now press F5 to execute the code in all open workbooks and check how the CalculateFull method is working in the Application.